From the rooftop event space on the Madison Building one night recently, downtown Detroit crackled with energy. The Tigers were playing next door at Comerica Park, iconic music man George Clinton and Parliament Funkadelic performed at Campus Martius and people jammed the streets, restaurants and outdoor bars. As darkness fell, the gilded tower of the Fisher Building glowed in the distance. The prize is a godsend for any new or struggling entrepreneur: A $50,000 grant from Comerica Bank, along with legal, architectural, advertising and other technical assistance with a value that Hatch values at another $200,000. With its $50,000 prize, Hatch Detroit is not the largest program for ambitious startups -- Motor City Match, a one-year-old program administered by the Detroit Economic Growth Corporation, gives away $500,000 to multiple businesses four times a year. Hatch is one among many such competitions, funds, boot camps and tutorials aimed at startups and small businesses over the past decade. But it’s the most talked about, partly because online voting plays a role in determining winners, and partly because Hatch winners and finalists tend to be fashionable lifestyle businesses run by plugged-in young people eager for a niche in the downtown renaissance. 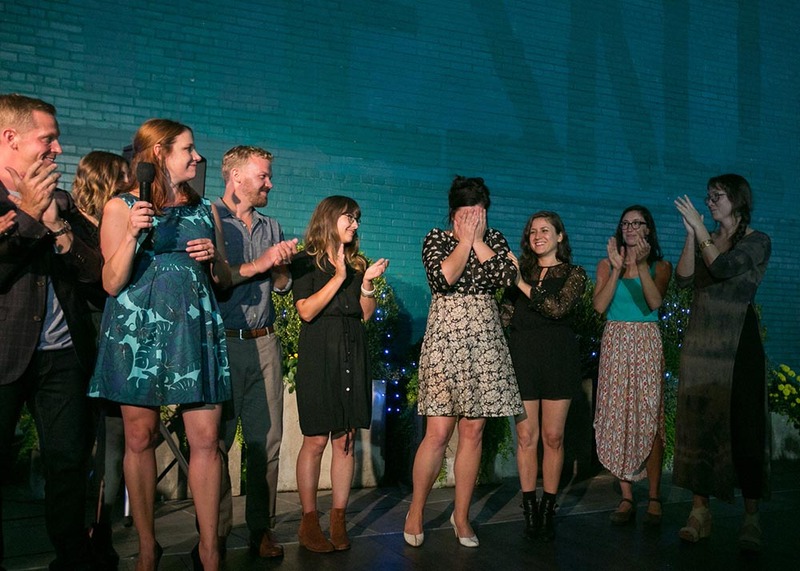 The five previous Hatch winners were Hugh, the stylized housewares shop on Cass Avenue; La Feria, the Spanish tapas restaurant near Hugh; Batch Brewing; Sister Pie bakery and Live Cycle Delight, a spinning studio. Ten runners-up have opened brick-and-mortar outlets, and 16 Hatch alumni operate as pop-ups. Hatch has another distinction that sets it apart from many other similar programs in Detroit: Its whiteness. It’s a characteristic that is difficult to ignore in a city that is 80 percent African American and where discussions about the lack of black participation in Detroit’s rebirth have been taken up by observers ranging from neighborhood development activists to Nolan Finley, the conservative editor of The Detroit News’ right-leaning editorial page who is white. No one disputes the idea that the new-found prosperity in some neighborhoods should be shared by all, including white entrepreneurs with a business to promote. But the frustration persists because the city’s recovery remains highly uneven. As creative storefronts, new housing and intriguing pop-ups appear in Midtown, downtown, the east riverfront, Corktown, Eastern Market and Indian Village, many of the main thoroughfares in the sprawling city remain dilapidated. The schools struggle, crime hits outlying neighborhoods harder than the well-protected central city and large numbers of the best-paying jobs remain in the suburbs, beyond the city’s dysfunctional transit. Detroit is the most impoverished big city in America, with 39 percent of the population living below a poverty line of $24,008 for a family of four. The situation is further complicated by demographics: U.S. Census estimates show the white population is slowly increasing, while blacks continue to flee to the suburbs. “Detroit’s has very low opportunity for people that live here. Not none, just very minimal,” wrote Eric Thomas, a black Detroiter and brand strategist at a Detroit marketing firm, in a May post on his LinkedIn page. The post was titled “Why I Hate Detroit,” and it went viral. Few people would deny that the Hatch contest has given a boost to stores that enliven the city, but the issue of participation was on stark display at the Madison. The security guards were black, but the final four Hatch businesses – seven people in all – are white. The crowd was overwhelmingly white. Four of Hatch’s previous five winners were white, the exception being last year’s Live Cycle Delight, owned by an African-American woman. Of 10 runner-up businesses that have opened, two are black-owned. Katanski, Hatch’s executive director, immediately acknowledged the competition’s diversity was a problem when asked about it. She said Hatch leaders are very aware of the issue and have taken steps to address it. “We’re constantly discussing that,” she said. Katanski mentioned the Hatch methodology of allowing any member of the public -- regardless of whether they live in the city -- to vote for finalists as one reason why diversity is an issue. Even so, she noted, this was the first year the four finalists included no person of color. Hatch selects the 10 semifinalists before people cast their ballots, and she said officials do their best to see that those businesses better reflect the community. Among the Hatch semi-finalists over the years who failed to receive enough votes to advance to the finals, nine had African-American ownership; three were Asian and two were Hispanic. “Our goal is to make sure that our top 10 (semi-finalists are) as diverse as we can make them. That’s our major push,” Katanski said. Hatch this year hosted community workshops to help entrepreneurs improve their applications; officials reached out to community groups to publicize Hatch and interest residents in opening their own business. Hatch also has financed streetscape improvements in neighborhoods far from the downtown districts where young people are settling. The organization said it also plans to work with a diversity specialist in the coming months. “It’s a year-long process, and we will be working this year,” Katanski said. Hatch started in 2011, a historic period in the rebirth and rebranding of downtown Detroit. That’s the year Quicken Loans founder and uber entrepreneur Dan Gilbert began his Bedrock real estate company and bought the Madison Building, the first of what has become more than 80 downtown properties under Gilbert control. Gilbert’s Opportunity Detroit promotional arm sponsored Friday’s Hatch event. Hatch founder Nick Gorga, vice chair of the litigation department at the Honigman law firm said he saw the need for stepped-up retail when he returned to Detroit after working in Chicago, where he lived in the bustling and upscale Lincoln Park neighborhood. On the Madison roof, more than 150 smartly dressed people drank local craft beer and sampled pork belly sliders, tostada almogrote and velvety Mexican hot chocolate ice cream from Hatch’s previous winners and runners-up in the food business. Members of the final-four teams mingled, nervously. Hatch received over 150 entries this year. The staff, board members and volunteers -- development experts and Detroit residents -- whittled that down to 10 semifinalists, two of whom were African American. Just as notable, half of the final 10 wanted to open in neighborhoods outside of the thriving central core, including a bakery in Highland Park and a wine bar in northwest Detroit. The public chose the four finalists and then again for the winner. Voting is conducted online and at community voting booths. After the public votes, a panel of judges steps in. This year’s final four contestants -- a pottery studio, farm-to-table restaurant, women’s clothier and a massage spa – pitched their concepts to judges Friday evening at the Madison and answered questions. “It’s really our vibe that sets us apart,” Taylor Bolleber, owner of Bird Bee, http://shopbirdbee.com/ a “boho clothing” boutique, told the judges. Gwen Meyer and Alison Heeres, of Coriander Kitchen & Farm, drew laughs and applause from the crowd when they burst onto the stage carrying plates of food and served the judges dinner. Then the judges retired to deliberate. Hatch declines to release specifics about how many votes contestants received, or the judges’ role in determining the winner. So it’s unclear if judges have ever overruled the popular vote for the winner. Meta Physica currently provides massages in a small Midtown studio. She and Hollis are engaging businesspeople who combine talk of “price points” with the detoxifying benefits of the massages, saunas, juice bar and herbal apothecary they plan to offer when they move to the second floor of a 90-year-old building at Trumbull and Bagley in Corktown. The spa’s victory illustrates another Hatch conundrum: Hatch founder Gorga wants retail density, but their business, however unique to Detroit, will further strengthen one of the city’s most thriving neighborhoods while other neighborhoods are dying for stores. The building on Trumbull, and an adjacent structure built in the 1870s, are owned by Brian Mulloy and wife Stacy Mulloy, who recently moved into an upstairs apartment. The buildings are home -- or soon will be -- to a barber and beauty shop, a restaurant selling sustainable sushi, a local-products grocery and a clothing and home décor boutique. The Mulloys also have plans to build two more buildings on their property. Biernat and Hollis say they will combine the Hatch grant with a loan and personal savings for a total investment of between $112,000 and $120,000. Work will start soon, and they hope to open in Corktown early next year. They said they plan to hire about 10 employees, all Detroit residents, and massage therapists will earn half the price of a massage, which will run about $60. Biernat and Hollis have many friends who are running businesses in the city, and their passion for Detroit burns brightly. “We’re trying to activate this whole corner,” Biernat said. Hatch says 14 alumni -- winners and runners-up -- have opened storefronts, creating more than 80 jobs and investing $2.5 million in Detroit and Hamtramck. Katanski insists Hatch wants to improve its metrics on racial diversity, and Aubrey Agee said he believes her. Katanski reached out to Agee, who works with entrepreneurs at Wayne State University and was part of the panel that winnowed the Hatch contestants to 10 semifinalists, for help in making Hatch contestants better reflect Detroit. Hatch’s lack of diversity “is a true frustration to” Katanski, Agee said. He said Hatch could do better in finding a broader range of candidates, but he emphasizes the need to spread the word among Detroiters that they can vote for candidates who want to open stores in outlying neighborhoods. Other Detroit organizations that help entrepreneurs have managed to find a diverse group of clients. Mayor Mike Duggan has encouraged outside entrepreneurs to start businesses in the city, but he also is careful to note Detroit “has a commitment to creating a comeback that includes all Detroiters,” as he told the Democratic National Convention in July. In reporting on grants by the city’s Motor City Match, which uses federal grants to help businesses and landlords, Duggan told reporters nearly 70 percent of applicants were African American, and fifty percent were women of color. Linda Forte, senior vice president for business affairs at Comerica and a veteran development official in Detroit, was instrumental in getting the bank to fund the Hatch winner for the past five years. Forte, who is also Comerica’s chief diversity officer, said she and bank officials loved Hatch’s focus on building independent retail in Detroit neighborhoods. “I thought it had a tremendous opportunity for a ripple effect,” she said. Forte too said the overall diversity of past semi-finalists and finalists is better than this year’s all-white final four would indicate. One problem she sees goes well beyond Detroit: the deficit black businesses in general have in securing necessary funds. Hatch judges might see a potential problem in getting some black businesses open, she said. “It’s no surprise that we have businesses that are owned by more diverse individuals that are maybe a little behind in capital development,” Forte said. In any case, Katanaski said Hatch is serious about diversity, and has plans to do better. “It’s definitely something that we are active about and are incredibly interested in continuing and moving that forward,” she said. Perhaps institute a quota system for inclusion of non-white winners or some sort of blind selection process whereby race and/or gender is not evident to the selection committee or voters. So does Hatch give the prize to the best business plan, or someone else because diversity and inclusion? It seems the issue arises in the initial voting, which does the narrowing. The business plans don't really get evaluated until then. The idea mentioned in the story of mobilizing a broader range of voters is one way of addressing that. It might also help spread the retail around if more voters were city residents. They might be more attracted to retail ideas in neighborhoods where they live, as opposed to suburban voters who are attracted to retail ideas in neighborhoods where they visit. Neither is wrong. It just seems to be an unintended consequence of how the competition is structured. The Free Press reported a figure that I had not heard before. Fifty-eight percent chronic absenteeism in Detroit schools. Hard to learn to read when you are a chronic absentee so Detroit has 47% reported illiteracy. Hard to be an entrepreneur when you are illiterate. The most pressing problem is to get parents to understand that they play a role in getting to school, making sure homework is done, attending conferences to understand how their child is doing, and providing encouragement. Rich, that same article mentioned first the upscale suburbs of Washington DC as having this issue of chronic absenteeism......Montgomery County, MD and Fairfax County, VA. Do some upscale parents have the same lack of involvement in their children's education as you see in Detroit? I lived in the DC corridor 15 years ago, when my husband took an active duty tour at Ft. Meade, MD, between DC and Baltimore. The counties you mentioned are not economically homogeneous. Both have extensive impoverished enclaves. One thing you learn about the DC area, is that it is demographically quirky. You go from fancy to dicey and back to fancy in the blink of an eye, all on one long thoroughfare. Some place could be described as upscale that is not exactly so. that said, I have read articles recently about the problems of privileged children--absenteeism from school, drug use and commission of petty crimes by teens parented by essentially nobody. Our society is troubled all around. why do so few people buckle down to the job of being mom or dad?? Exactly Bob! Rich, let's not assume that all or even most Detroiters are illiterate. I am a product of Detroit Public Schools with a Masters Degree. I am also a business owner, residing in the city, and I haven't received any financial assistance with my existing business. So this article rings true with me, as well as others in my circle. I would love to have financial assistance with the purchase of a location for my business. Monica. I believe the accepted number, which I quoted, is 47% illiteracy. That makes 53% literate. And in both cases, there will be varying degrees of illiteracy / literacy. But the point is, 47% is way too high. Children that are read to at a very early age develop a love for reading, and my point is that it starts with parental involvement. The 47% number is really old, and based on bad data. http://datadrivendetroit.org/danny-devries/another-fine-mess-mass-confus... Census data shows there are about 170,000 working age adults outside the counted labor force in the city. No one knows the literacy rates- city, state, feds, or otherwise. Thank you for this comment. I was getting tired of being the only person commenting that parents must parent their children every minute of every day. If you are not right there, then what you believe and what you expect must be there in your child's psyche. The only way a child learns to sit down, pay attention and learn is by a parent implanting the discipline to do so in a child's mind. Schools fail when parents fail. full stop. I know that I am old, age 62 is sit in the rocker and think back to the old days time. But I cannot help but think how sad the situation in Detroit is. People are making pies, running spinning shops, selling cute little purses and little plates of trendy food in a place where my ancestors and all the other huddled masses who yearned to breathe free made a beach head and then a life for their descendants. Tens of thousands found a job in a place that now employs tens. Schools that educated thousands now grow a few plants in their deserted courtyards for twenty. I guess you can simply lower your sights and say, "Well it's something, anyway." But is it helping the masses of people who are trapped in the city without jobs, transportation or grocery stores? From the lack of progress in those areas for those people, I guess we have to say "no". But that is my problem--I come from a time, and a people, who dreamed big, thought big and performed. Today, it's about doing something fun and following your "dream" and "your passion". Well, in the face of no other choice I guess you might as well enjoy what you do. Let's face it--would opening up a union machine shop make it, in the face of robotics and off shoring? Wait--aren't there jobs going begging in out county Michigan because there's no good public transit?? I would love to see Bridge do a cross-program analysis with the likes of Hatch, NEIdeas, Motor City Match, and the plethora of other similar programs out there. Cross referencing metrics, intended deliverables, and short/medium/long-term efficacy would be a good service for the city and the region. Great story! Thank you, Bill and Bridge, for raising an issue that other media are afraid to discuss. Kudos! Great story? So they should give the award because of demographic and not for best business plan? Hi, David! I didn't see in the article that Hatch collects statistics on where their voters live. As a past Hatch voter myself, I know they don't collect residential information when you vote. Perhaps they collect IP information that allows them to track location? But it would be a dangerous presumption that wherever you are voting from is where you live. My point is that I'm not sure we actually know for a fact that "the vast majority" of Hatch voters live outside the city, as you claim. If the voting scheme is part of the problem, though, what are the possible solutions? Perhaps there should only be in-person voting at Detroit locations, rather than online? Or perhaps voters should have to enter their residential address and confirm they live in Detroit? Or perhaps the Hatch judges should ensure that every major Detroit neighborhood is represented in the finalists? I would have loved to hear the ideas the Hatch folks have to increase diversity in their finalists and winners. A persistent problem, though, will be that commercial density is key to creating a walkable, urban environment. Based on my husband's experience running a small business in Detroit, even in the central business district neighborhoods of Midtown and Corktown, density matters significantly in driving traffic and profits to local shops. Without a critical mass of popular storefronts, it's hard to imagine small businesses (especially non-food service shops) thriving. I think Hatch's inclination to promote commercial density is the right idea. A tough call to decide if the situation is proper or not since we don't know how many total minority applicants there are. It is possible Hatch Detroit simply does not attract a lot of minority applicants for any of a number of valid non-sinister reasons. Maybe it is just that Hatch Detroit mainly targets upscale young whites because that is their main market and no discrimination is intended. If a major outreach was made by Hatch Detroit and a number of minority applicants came forward and over time no minority applicant was found worthy then there might be a need to question the selection process. It behooves Hatch Detroit to try to do more outreach to the minority community but right now I don't think the fact that there are few if any minority winners indicates that anything sinister is going on. Do outreach and if next year there at least are not more minority finalists then I would be concerned. Last year Dameon Gabriel had a plan for very impressive restaurant and Live music venue, I thought being the nephew of a well known musician known around the world (Charlie Gabriel) and coming from the Gabriel Family who migrated here in the 1940's, had a chance, but he never did. Badd Miss by The HACTHet people ! The implication of the headline is that either the selection process is racist or that minorities can't compete. Pick one and prove it. Otherwise, you are just fueling racial animosity without any basis in fact. A small step up from name-calling. This is a Stupid article and reflects what is wrong with America. Everything is becoming Black vs White. I encourage folks to listen to Black Talk Radio in Detroit and it will make you sick. I am very disappointed in Bill McGraw. Maybe the ideas from Blacks just were not as good! It is like Wayne State for decades have gone out of their way to admit Blacks.....and yet so few end up graduating. I will add this....it is all coming home to roost. For the past five decades, ~80% of the Babies born are to unwed mothers with the vast majority already living in poverty. There is a difference between poverty and generational poverty. Unfortunately, generational poverty is skyrocketing in Detroit and other urban areas. One can argue that Government Programs with good intentions caused unintended consequences such as dependence on government and the break-up of the family. Data shows that in the past 8 years alone, a 58% increase of Blacks on Food Stamps, a 20% increase of Blacks not participating in the workforce, and DPS reports just about all students receiving a Free or Subsidized Breakfast & Lunch. Education as a priority and change within one’s community can turn things around. If not, generational poverty becomes more of a comfortable poverty in America for more people. Pointing to Racism and White Privilege is a false narrative for today and does nothing to provide economic education or solutions.